“Stay hydrated.” This is typical advice given to travellers. In the U.S., land of plentiful drinking fountains, the advice is easy to follow. Here in France, things get a little iffier. France has loads of wonderful fountains. 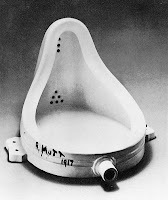 Its artists like Marcel Duchamp sometimes display an ordinary object (see above) and call it "fountain." What finds no place in the landscape is the drinking fountain. What to do? Help the local economy by spending money, i.e. buy bottles of water. They don’t have to be Evian or Vittel. Store brands do just as well. So now rule 1, stay hydrated, can be followed, if at a cost. Then comes an adjunct to the rule: water in/ water out. This poses a significant challenge. Where oh where to find a public restroom in this country? People visiting France often comment about how the locals must have well-disciplined bladders. Public rest rooms are hard to come by. Clean public rest rooms equipped with toilet paper, even harder. Some locales are better than others. Passengers on trains find accessible toilets. Major rest areas on the toll-supported highway system are equipped with ample, clean facilities. 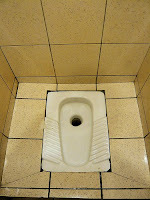 Customers in large malls are also well served by central public restrooms. Major department stores offer the same, although these are often difficult to find. All of the above are usually free of charge. Railway stations are another good bet for a clean toilets, but charge a fee. So, with all these opportunities, what’s the problem? Well, tourists do not spend most of their time on trains, on the highways, in malls or railway stations. They find themselves in cities or villages and here things get more challenging. The situation is such that someone is actually selling a pamphlet entitled Paris Pause-Pipi Guide. 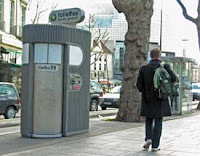 It identifies the location of public toilets. Without such a guide, or even with it, if one is at quite a distance from the nearest point of relief, the only option is to head for a café and, once again, help out the economy. Two cups of coffee might go for 4 to 6 euros, ($5.60 to $8.40), but will bring with them the privilege of using the café’s toilet. A cheaper option might be to pop into a McDonald’s or its French equivalent Quick. If in an urban area, it will almost always be necessary to ask for the access code to unlock the passage to the rest room. It used to be easier, at least for men. When I first visited Paris in the 1960s, the city’s streets were dotted with quaint metal structures known as vespasiennes. In less formal parlance, this was a “pissoir.” They were simple: a place to urinate. They were public: right there on the sidewalk; public also in that one’s face and legs were visible. Their strange official name derives from the Roman emperor Vespasius who came up with the idea of levying a tax to support publicly placed bodily relief stations. Even when vespasians were prevalent, they did nothing to help women. Their replacement, friendly to both sexes, is the sanisette. Sanisettes are strange looking, concrete, oval contraptions. Some are free, some require payment. The inside is mechanically cleaned after each usage. Buying a special guide to their locations is not really necessary. A website run by the Paris mayor’s office provides a list. The sanisette’s stainless steel efficiency may not be aesthetically satisfying, but it does provide a predictable environment. This is not always the case in cafés at which one has dropped 5 or more dollars. A still prevalent surprise: the “natural way toilet,” better known as the “turkish toilet.” This is essentially a porcelain base in the floor. It has two places for feet and a hole for discharge. As its “natural way” name indicates, we are here brought back to the ways of our far-distant, pre flush-toilet relatives who were adept at the squat-and-go-in-the-woods way of doing things. Except for those who find this nostalgic, the toilette à la turque is an annoyance. It is made all the more so since cafés do not announce ahead of time what will greet the customer who opens the rest room door. Such surprises are sort of the stock in trade of going abroad. In fact the French rest room search validates two truisms about travel: 1. Why go if it’s not at all different from home? 2. Expect to help the local economy in unexpected ways (water bottle purchase, backup toilet paper, coffee costs in café). One fun thing to do in Paris (okay, when you've exhausted all the other fun options) is to find a sign ostensibly pointing you toward a public toilet and follow it to try to find the toilet. I've actually never won this game, after several tries.